The Keeshond is a dog breed that encompassed many personality traits of the ideal housedog. This breed of dog is reasonably lively and playful. It is also an extremely attentive and affectionate housedog, making it a great companion for a child or adult. The Keeshond is always ready for an exciting adventure. However, on the other hand, this breed can be completely content in just relaxing and taking it easy. The Keeshond shows personality traits of sensitivity and fast learning skills. This breed of dog is overall very friendly, yet always has awareness for danger. As an extremely lively breed, the Keeshond needs ample exercise to keep content. Daily moderate exercise such as a good walk on a leash along with an energetic game can keep this breed happy. 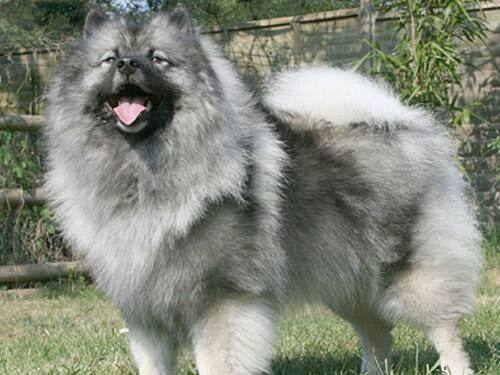 The Keeshond can live in the outdoors in temperate to cool climates. However, since it is an exceptionally social and affectionate dog breed, the Keeshond prefers to share its time indoors with its family. This dog breed has a double coat and it needs brushing at least once or twice weekly, and even more often when shedding. The Keeshond has a life span of twelve to fourteen years. This breed of dog does not have any major health concerns. However, some of the more minor health concerns associated with this dog breed are CHD, epilepsy, and patellar luxation. Occasionally, renal cortical, hypoplasia, and tetra logy health concerns are seen in the Keeshond. The Keeshond is part of the family of spitz dogs. However, its particular origins are unknown. Since the eighteenth century, this breed seems to have been well recognized in Holland as a companion and watchdog. Later, this dog breed became known as the barge dog due to its frequent position as watchdog on small vessels navigating the Rhine River. By some miracle, the Keeshond became involved in the political events of Holland during the years that led up to the French Revolution. The leader of the Patriot faction, Kees de Gyselaer, owned a barge dog named Kees. This particular dog appeared in so many political cartoons that him and his breed became the symbol of the Patriots, calling them a dog of the people. However, unfortunately for the Keeshond, the Patriots did not come out on top and many of the dog owners got rid of their dogs so they would not be recognized as the losing party. Along with these negative circumstances, the Keeshond also faced more problems when the barges that floated the Rhine became larger. Because of this, the small Keeshond breed became unpopular as a barge dog. Yet, regardless of these unfortunate happenings, the Keeshond breed survived below the radar by the efforts of a couple loyal river boatman and farmers. In 1920, an effort to rescue the surviving members was made by the Baroness van Hardenbroek. The breed was in England by 1925 because of how successful she was in obtaining friends for the Keeshond. Then, finally in 1930, the Keeshond gained AKC recognition. The breed continued its success, later recovering in its homeland as the national dog of Holland.